New Education set (Panama Canal) - LEGO® 報料區 - HKLUG 香港樂高迷用戶組討論區 - Powered by Discuz! LEGO is producing a set to commemorate the widening of the Panama Canal. The 1184-piece model shows how the locks allow ships to traverse the height difference between the Atlantic and Pacific Oceans as they travel through the canal. It will be available only in the country so is likely to be somewhat tricky to source, particularly as it appears that only 40,000 are being produced. "Building facilities in the Panama Canal Administration will be released the first set of commemorative pieces of Lego Panama, celebrating the expansion of the Canal. This is the third set of locks in Lego Education. This exclusive and limited edition for Panama will have 40 thousand units, and is the first Lego Education makes a set a world wonder. The initial idea was proposed by Lorena Degracia, founder of Panama STEM Education, the administrator of the Panama Canal Authority (ACP) , Jorge Quijano. The idea was enthusiastically welcomed by the ACP and Lego Education in Denmark, who started the creative design and prototyping process. The set carries in his box the official logos of the Panama Canal and the third set of locks, and consists of 1184 pieces. "Most people sure will buy will be adults to have it as a collection, but what we want is to make him understand and give the option to the Ministry of Education to explain in an interactive way how the operation of water levels, explain and both teach what happens on every ship passing through Panama, how it does, etc. This set is completely educational, "said Degracia. Lego Group is composed of three parts: commercial Lego, which are found in toy stores; Lego Foundation, which is a center of creativity, games and lessons; and Lego Education, which is the approach to education, science and robotics. The set of the third set of locks Lego Education is available to the public from the first week of December 2016, with a price that will be around $ 250. 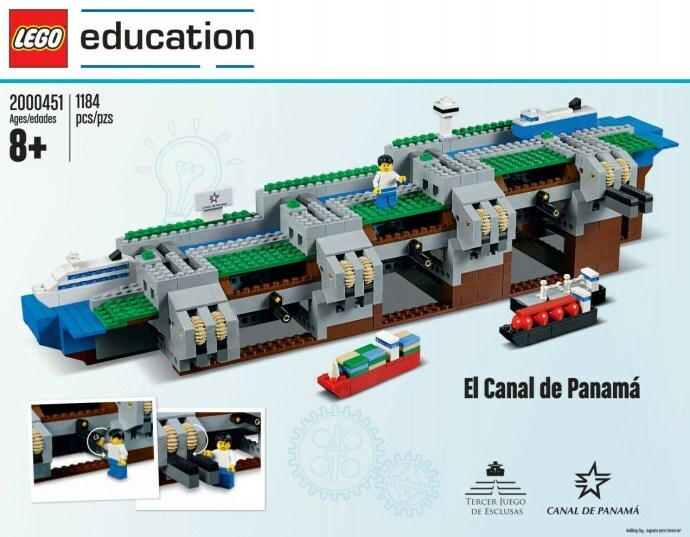 LEGO Education Panama Canal (2000451) Now Available Worldwide – The limited edition set can now be purchased outside of Panama and includes free worldwide shipping. GMT+8, 2019-4-24 04:16 , Processed in 0.194529 second(s), 26 queries .